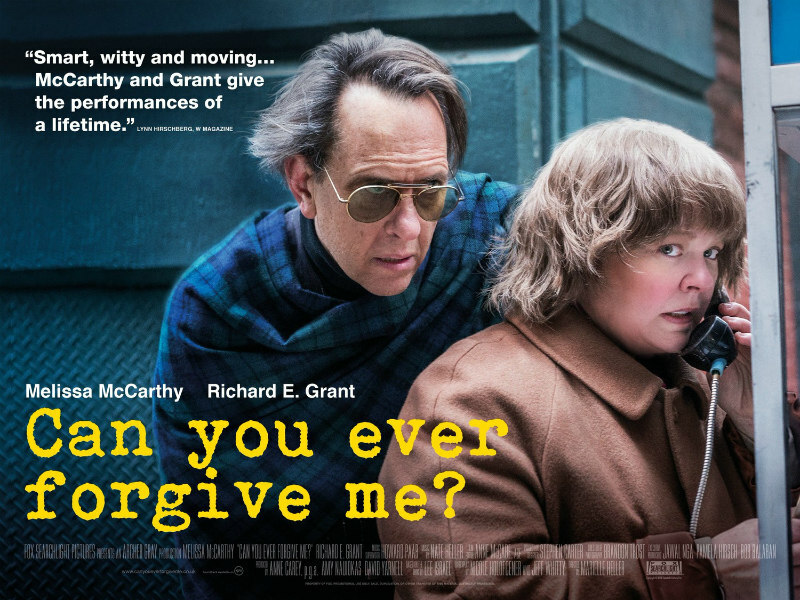 New Release Review - CAN YOU EVER FORGIVE ME? The story of author turned literary forger Lee Israel. Once an author of successful celebrity biographies, Lee Israel found herself in financial dire straits in the early '90s, her increasing alcoholism and abrasive personality costing her a succession of jobs. Director Marielle Heller's adaptation of Israel's 2008 memoir, Can You Ever Forgive Me?, catches up with Israel (Melissa McCarthy) as she's just been fired from her latest copywriting job. Months behind on her rent and unable to pay the backlog of vet's bills necessary to have her sickly cat seen to, Israel flogs a signed letter from Katherine Hepburn, the subject of one of her biographies, and is pleasantly surprised when the buyer offers $165 (over $300 in today's market) for the piece of Hollywood history. Soon after, while thumbing through a book on vaudeville star Fanny Brice, the subject of her latest planned biography, Israel lucks across a signed letter from Brice herself. Israel is disappointed however at the relatively small sum offered, the blandness of the letter cited as the reason for its relative lack of value. Purchasing an array of vintage typewriters, Israel sets about penning a series of fake letters from dead celebrities, using her knowledge of the stars in question and her own wit to imitate their writing styles. The bookstore owners of New York are overjoyed at Israel's finds, which she claims were languishing in the collection of a cousin, and the fraudster is quickly raking in the cash. But when suspicions begin to arise, Israel is forced to rely on the closest person she has to a friend, destitute wannabe man-about-town Jack Hock (Richard E. Grant), to pass off her work, along with authentic letters she begins stealing from libraries and archives. Just as she did with '70s San Francisco in her directorial debut, The Diary of a Teenage Girl, Heller captures the mood of early '90s New York without falling back on any distracting specific cultural motifs - the soundtrack consists largely of jazz from several decades previous, and the players dress in clothes considered vintage by 1991. Instead it's the focus on that increasingly extinct institution, the second hand bookstore, that grounds CYEFM? in a distinct time and place. If the wonderful New York bookstore that makes an appearance at the end of Todd Haynes' underseen Wonderstruck gave you a warm glow of nostalgia, you're in for a similar experience here as production designer Stephen H. Carter lovingly takes us back to a time when you could spend hours perusing the shelves of bookshops that boasted multiple floors. With its musty Manhattan milieu, caustic wit and jazz tinged score by Nate Heller, CYEFM? resembles Spielberg's Catch Me If You Can as directed by Woody Allen. Heller, McCarthy and writers Nicole Holofcener (who was originally set to direct with Julianne Moore in the lead role) and Jeff Whitty have fashioned a fascinating anti-heroine in Israel. Their film never pleads for our sympathy towards Israel, and by the 15-minute mark we've already witnessed her swearing at an employer after being fired for drinking on the job, stealing someone else's coat at a literary party and allowing a homeless man to buy her drinks. And of course there's her crime, which is far from victimless. For one, she's stealing money from the pockets of bookstore owners (and boy will they need those funds in a few years), but she's also stealing the legacy of the dead in imitating the voices of those who enjoyed a level of success she could never achieve herself. Israel prides herself on being "a better Dorothy Parker than Dorothy Parker," and her letters were clearly convincing enough to fool many an expert (one biography of Noel Coward notoriously featured quotes attributed to the British playwright that had actually been penned by Israel), but of course she was merely engaging in a form of literary graverobbing. 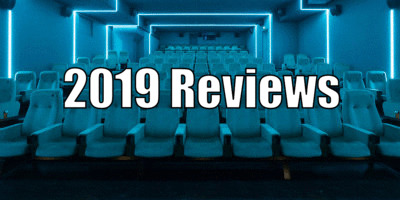 Considering this brought me back to the debate in cinema regarding bringing dead actors back to life with digital technology, ala Peter Cushing's "appearance" in Rogue One. Isn't profitting by imitating the talent of a dead star exactly what eventually brought the attention of the FBI on Israel? At this point, it shouldn't be a surprise when a comic star delivers an impressive 'straight' dramatic turn, but if you only know McCarthy from her broad shtick in mainstream comedies like Bridesmaids and Life of the Party, you may be taken aback by just how subtly great she is here. We may not sympathise with her Israel, as she's largely her own worst enemy, yet McCarthy's portrayal of a woman who displays a tough exterior while slowly crumbling inside from a combined sense of guilt and professional failure allows us a degree of empathy. Plus of course, villains are often a lot more fascinating than heroes, and in an age when Hollywood's reaction to an appeal for "strong female characters" is to increasingly give us patronising portrayals of flawless women, spending two hours in the company of a woman as humanly flawed as Israel is a breath of fresh air. Despite its blackly comic verneer - with most of the laughs courtesy of Grant's entertaining but melancholy turn as a man who is himself a fraud in his own way - CYEFM? is first and foremost a true crime drama, and in points it's very much a thriller. Heller employs Hitchcockian suspense techniques to inveigle us into Israel's crimes to such a degree that when the net begins to close around her, we almost feel as if we, the audience, are accomplices. Unlike the letters that made Israel initially rich and ultimately a wanted criminal, Heller's film is the real deal. Can You Ever Forgive Me? is in UK/ROI cinemas February 1st.